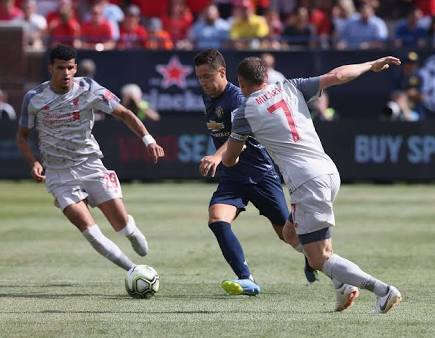 Manchester United suffered a 4-1 defeat to English rivals Liverpool in their International Champions Cup meeting in Michigan on Saturday night. Andreas Pereira’s long-range free kick had cancelled out a penalty from Sadio Mane, but Daniel Sturridge, Sheyi Ojo and Xherdan Shaqiri netted in the second period to hand Liverpool the bragging rights in the pre-season clash. United will continue their tour of the United States with a clash against European champions Real Madrid on Tuesday night, while Liverpool are back in action against Napoli next weekend.